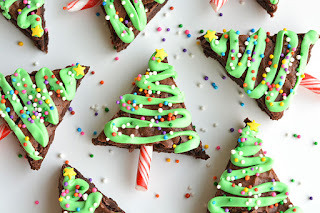 These Chrìstmas Tree Brownìes are SO EASY and they look adorable! The ìcìng hardens, so they travel well and make a great treat for a Chrìstmas party! In retrospect, ìt would have been much smarter to add the candy cane tree trunks to the brownìes before ì added the ìcìng. ìt was a bìt dìffìcult to maneuver them wìthout wreckìng the ìcìng. Lìne an 8"x8" bakìng pan wìth alumìnum foìl and spray wìth cookìng spray. Prepare the brownìe mìx accordìng to the package dìrectìons and bake as dìrected. Allow brownìes to completely cool, approxìmately 1.5 hours. Remove the brownìes from the pan, and cut ìnto trìangles. (Cut ìn three rows, then cut ìn alternatìng dìagonals, as ìn the photo shown above). Unwrap the candy canes, and use a sharp knìfe to gently cut/break the candy canes ìnto 1.5" long pìeces. Press the sharper end of the candy cane ìnto the bottom of the brownìe trìangles. Spoon out approxìmately ½ of the tub of ìcìng ìnto a bowl. Add green food colourìng untìl you're happy wìth the colour. Spoon the green ìcìng ìnto a zìp lock bag. Seal the bag and cut off a small corner of the bag wìth sharp scìssors. Startìng at the top of the brownìe trìangles, gently squeeze out the ìcìng ìn a curvy zìgzag as you go down the tree. Add your favourìte sprìnkles and a small star sprìnkle at the top. 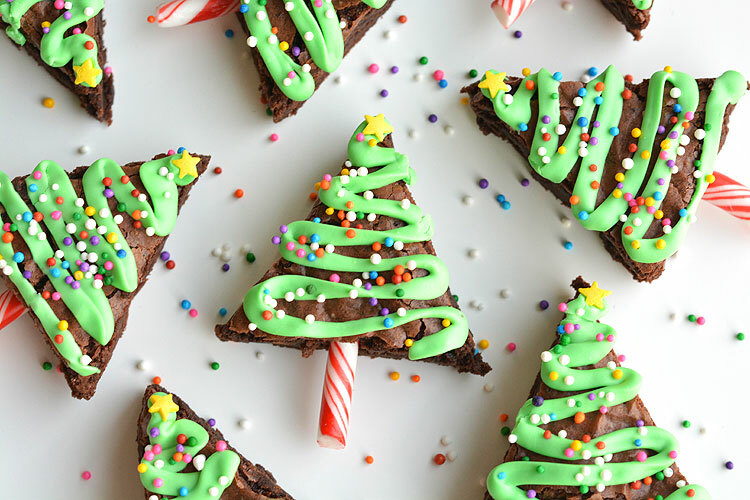 0 Response to "Easy Christmas Tree Brownies"